A wonderful example of nature-based tourism, the Valley of the Giants Tree Top Walk is a must for outdoor enthusiasts of all ages. The 0.4 mile (about 600m) walk takes place along a specially-constructed boardwalk, 130 feet (40m) above the forest floor, and winds through the heart of a massive karri and tingle tree forest, where walkers are literally surrounded by the forest canopy, in the company of true giants. The walk has a gentle gradient, allowing access for wheelchairs and strollers, and connects with the Ancient Empire boardwalk, a cleverly-designed pathway that brings the grandeur of the 400-year-old trees into sharp relief. 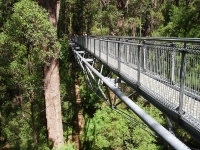 Opened in 1996, the Valley of the Giants Tree Top Walk has already thrilled millions of visitors in its short history - a concrete testament to the uniqueness of the experience it offers.